This is an interesting as well as great vintage for Latour. As indicated in my barrel tasting report, Latour's 1994 possesses an atypically high percentage of Merlot (27%) in the final blend. Because of this, the wine appears to have a sweeter, more fleshy texture than is typical for a young Latour, but do not make the mistake of thinking this will be a commercially-styled, easy to drink wine. It exhibits an opaque dark ruby/purple color, and a backward, intense textbook nose of walnut and cassis scents complemented by smoky pain grille notes that build in the glass. 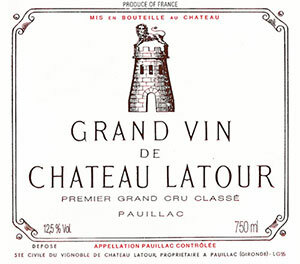 This full-bodied, powerful, layered Latour reveals high tannin, but no bitterness or astringency. The superb purity, fabulous precision, and remarkable length should ensure 35-40 years of longevity. Readers will find more fat, flesh, and glycerin than usual for a young Latour (save for such great vintages as 1982 and 1990), but don't be deceived, this wine requires 8-10 years of cellaring. Anticipated maturity: 2005-2035.